GROWBOX.ACC (6k) adds window animation (as in Atari GEM) to PC GEM. MONITOR.ACC (17k) is a desktop accessory to switch a Compaq laptop (tested on SLT286 and LTE Lite/25 386; may work on others) between its internal LCD and an external monitor. PALETTE.ACC (18k) allows you to amend the VGA palette. Source is also available. VMCOLOUR.APP (24k) allows you to edit the colour schemes in ViewMAX/2. Source is available. VGAPATCH.APP (29k) patches GEM/1 so that it works at VGA resolution. Source is included. UITEST.APP (50k) is what might get called a rigged demo . 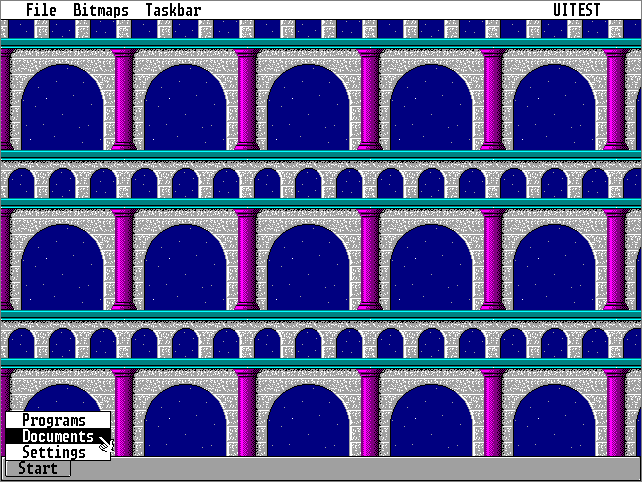 It demonstrates the bitmap background and colour icon functions in the current FreeGEM AES, and a popup menu library - see a screenshot. EDICON 2.00 is a GEM icon editor, which can edit the GEM desktop icons and export or import Windows .ICO files. Source is also available. SYSFONT 1.00 allows the GEM system font to be edited. It can also use files in the DOS, PSF or Spectrum +3 formats, or the TOS 1.00 ROM. Source is also available. A GEM implementation of 2048, the sliding-block game. Source is also available. Note that the AES, the Desktop, drivers and GEM/XM have their own pages. A new version of the Resource Construction set (85k) which supports 3D controls, checkboxes etc. Source (136k) is also available. EDICON (40k) is an icon editor for the GEM desktop icons. If your browser doesn't download this correctly, try the .ZIP version. Note that it has been superseded by EDICON for GEM above. RESDIR (20k) rewrites GEM.RSC to contain the current directory rather than \GEMAPPS\GEMSYS. It can therefore be used to run GEM from a different directory. GEM font tools (14k): Some simple tools to manipulate GEM fonts embedded in drivers. For UNIX or DOS+DJGPP. For GEM itself, use SYSFONT above. A GEM/5 theme (3k) for icewm. SDSDL (383k), a port of the GEM/3 VGA driver to SDL.